Today’s Funambulist Paper complements well yesterday’s launch of the eighth volume of the Funambulist Pamphlets dedicated to the work of Arakawa and Madeline Gins since my guest, Erin Manning (see my interpretations of her books 1 and 2) examines in her extensive text their shared interpretation of design and the body with Comme des Garçons‘s founder and designer Rei Kawakubo. An anecdote is always a good way introduction, so I will say that Erin and I convened of the topic of her essay while we were at Comme des Garçons’s Dover Street Market New York inside Madeline Gins and the Reversible Destiny‘s recently built permanent monumental stairs — to which I am happy to have contributed — before recording a conversation for Archipelago. There is therefore no chance involved in these multiple inspirational bridges! In the following text, Erin articulates how Arakawa+Gins and Kawakubo’s creative methodology both embrace the idea that we don’t really know what a body is, and what it can do. Such a statement does not seem much, but as we have seen numerous times on this blog, fathoming this simple fact have tremendous consequences both in the creative and political realms. Kawakubo says herself that she does not want to make clothes; this can appear as odd for a fashion designer but, as explained by Erin, it needs to be understood in the refusal to separate the cloth to the body. In other words, Kawakubo does not design cloth as such, but rather shapes bodies without knowing in advance what they should be, thus denying the power of the norm. My intention is not to make clothes. “Break the idea of clothes,” has been Kawakubo’s call for over 40 years, a call that has not only motivated the creation of some of the most intriguing clothes of the late 20th and early 21st century, but that has also actualized the potential for textile to architect a field of experience according to which a body is invited to continuously reinvent itself. In this sense, Kawakubo has pushed and continues to push the Spinozist mantra “we know not what a body can do” to its limit, recasting not only the realm of fashion but the way fashion situates itself in relation to other practices. Architecture is one of those practices. That Kawakubo’s creations are sculptural is well-known, but they are also more than that, they are architectural propositions. To say that fashion is architectural is often to speak of it in representational terms. Despite the visible architectonics of Kawakubo’s designs, this is not my approach here. What I want to argue instead is that Kawakubo’s textile creations function architecturally in ways that far exceed representation. They are productive. And it is in this sense that they are allied to what Arakawa and Gins call a procedural architecture. Arakawa and Gins define procedural architectures in terms of overlapping tissues of density. They are dense because of their propositional nature, because it is what they can do that is foregrounded, more so than how they look, or who they site. Procedural architecture is the creation, through architecture, of a set of conditions that enable a continuous counterpoint of propositions. Architecture understood this way must be considered beyond the built environment. To conceptualize the move between what architecture can do as a built environment and what it can do as a “world-constituting procedure,” Arakawa and Gins emphasize the bioscleave, an intermezzo that works as a persistent reminder that what sites life also cleaves the environment, the environment never a passive participant in this experiential cut. The cleaving of experience in the making is key to a procedural approach. Cleaving cuts open the field of experience. This cut has the effect of singling out this or that event, subtracting it out from vague potential not yet realized in felt experience. The cleave is that which activates, which tweaks the in-act toward the actual occasion. A procedural approach depends on the rigour of the proposition, on its capacity to activate the cleaving while not limiting the experience to only the act of the cut. What is at stake here is the way the procedural can open up a field of relation or an emergent ecology such that it can activate the conditions for the continued interplay that keeps life in the process of self-invention. Most architectures, Arakawa and Gins argue, do anything but, deintensifying instead the potential for difference. We follow their routes, we embrace their limits, and in doing so our lives become predictably oriented by them. What if instead we built toward the density of experience, beginning not with form but with the textures of experience, embracing the force of form that is the lively between of environment and body? What if instead of assuming that the built environment contained the pre-constituted body we interested ourselves in the amalgam of their co-constitution? The challenge is that the procedures of a procedural architecture must continuously be reinvented to stay apace with the architecting of experience. No procedure is failsafe, nor does one procedure work in all similar circumstances. A procedure must be crafted with care, must be relevant to the conditions already at hand, must be capable of activating the ecology of which it is part, must have enough longevity to leave a trace. More procedures fail than succeed. But this is part of their importance, that they put us in the way of experimenting. A procedure is always connected to a constraint. At its best, this constraint is enabling. It asks of habit that it activate its conditions of possibility. From here, the procedure pushes possibility to its limit, excavating at the edges where possibility and potential meet. This is where the procedure most often fails: habits die hard, including our habits of reconstructing the already-known. A procedural architecting will not be capable of opening up the field of experience if the manner of opening contains the habit fully-formed. What is essential is to work from the habit’s edging into experience, experimenting with the ways a habit’s repetition activates minor departures from the norm. The only habit which holds on absolutely to its form is the habit of reducing experience to the already-known. Both Arakawa and Gins and Kawakubo trust habit to the extent that they see it as a symptomatic reading of the everyday that will in some way figure in the procedural. The habit constrains the everyday, finding pathways through it. A procedural architecting looks at these pathways to see where else they go in their minor tendencies and seeks to amplify these shifts in direction. The world-constituting procedure that is the extension of the architectural procedure must never be fully abstracted from the force of these minor tendencies. This is another way of saying that what architectural procedures do, before they create architectures, is create modes of existence. Modes of existence as Etienne Souriau defines them, are not states but passages. They are the transitory and fragile interstices of experience that make a difference. It is through them that experience becomes singularly what it is. Modes of existence neither emerge from nor belong to a subject. They do not define existence, they propose it. Similar to the Whiteheadian actual occasion, modes of existence are ecologies that activate a field of concern. This concern is active in the event itself, a concern for the world in its unfolding. They are less species than speciations where speciation is understood as an emergent ecology rather than as a conglomeration of pre-categorized forms. They are speciations because they don’t name a state, but activate a modality that pushes existence to its intensive limit. They are speciations because they don’t fit into existence preformed but activate the minor gestures of its most potentializing edgings into experience. As such they are ecologies, ecologies in the sense that they are fields of relation that activate differential tendencies in the milieu of their co-composition. They act, they cut, they reorient: modes of existence are world-constituting procedures. Modes of existence are precarious. They come into being out of a necessity that has a procedural tending. But they do not outlive the procedural. They emerge as they are needed and perish in the creation of new fields of experience. It is not their stability that makes a difference, but the persuasiveness by which they affect all that comes into contact with them. This persuasiveness is in and of the event of their coming-to-be. For Rei Kawakubo, the constraint is a key procedure. While Kawakubo emphasizes the necessity for creation of an open field for experimentation, there is always focused attention in her practice to the quality of constraints and how they enable the potential not only of the fabric she works with, but of the very tissues of density she takes as her matter of concern. For Kawakubo as for Arakawa and Gins, what is at stake is not simply the form the product takes. What matters is how the constraint embedded in the procedure becomes enabling of new processes. For Kawakubo, what is at stake is the making itself, not the making of the object. The object does not define the purpose, and cannot be subsumed to it. What she strives toward is to create a series of enabling constraints that are procedural enough to create a mode of existence. In this regard, hers is a procedural fashioning: for each new process she invents procedures that push the very idea of what a garment can be to its limit. Kawakubo seeks not the final form, not the production of a neutral layer for the pre-existing body, but the very creation of a propositional field that activates what a body can do in its co-constitution with an emergent environment. This process of engaging with the working of the work is what Souriau calls “faire oeuvre.” Like the mode of existence, which never names an existence as final form but instead composes in the between of existence’s necessity, or existence’s persuasiveness, the oeuvre à faire is the force of making that only knows itself as such after the fact in the tense of “Oh! This is what I was looking for!” (Souriau 2009: 109). The not-knowing-in-advance is part of the procedure. Knowing is always to some degree reducible to the already-known. Habit will play a part, but it must be procedurally tweaked. What emerges from the process must push the habit to its limit, but it will only be able to do so if we understand habit as an ecology. The habitual carries within itself a certain degree of belief. The ecology of practices that is fashion believes, for instance, that it makes sense that a dress follow the shape of our body-envelope. This, we have come to learn, is how we clothe a body. Within the event of fashioning, we know, of course, that there have been other ecologies of practices within fashion, both cultural and historical, that have cut cloth in ways that accentuate parts of the body in ways that are today unimaginable. But even within the realm of the unimaginable – the bustle may not come back into fashion for a while yet despite Yamamoto’s and Kawakubo’s best efforts! – there are degrees. Each new season in the fashion world does bring something new, and the purchasers of fashion do tend to be open to trying out a change in shape, in cut, in texture. Sure, we collectively say, lengthen and accentuate the legs with skinny jeans! And then, the next year it once again seems perfectly plausible to widen the pant for the shortening of the leg that accentuates the waist. Despite the normative directions of fashion’s operations, mutability does have its place. As long as its tendings are relative to what came before, fashion’s mutations tend to be accepted as the continuation of the norm. That difference must remain relative to what came before is the important point here. While change is an option, the commitment to difference in seasonal fashionings tends to be constrained to possibility: difference rarely engages with not unimaginable not-yet. This way, difference remains predictable – it tends to have historical antecedents that are still recent enough to be alive in our collective memory of what a garment can be. In this regard the tweaking of the habit still remains within the realm of the habitual – it is more of a lateral stretch than a recomposition. But that it can happen at all suggests that there is potential at the edges of everyday repetition. The challenge is seeing the edges not as limited by the forms we are accustomed to. This is the force of Kawakubo’s procedural fashionings, that she understands that the edgings into existence of habit’s mutability are composed of the more-than of form, the more than of the existent shapings of garment-imagination. In this regard, her work is deeply architectural in the sense Arakawa and Gins give to architecture. It proceeds at the pace of a world-constituting procedure. This potential mutability is at the heart of what Deleuze calls “a belief in the world,” a concept akin to a world-constituting procedure that opens experience to its inventive limit. A belief in the world takes the world-constituting procedure as the processual invention it must remain. For world-constituting never means world-constituted. The fine-tuning must occur in the event – it is immanent to the event’s coming into itself. This means that the procedure has to be able to activate an enabling constraint that keeps it open to the belief. In any given context, this constraint will necessarily have to work in the interplay between the habit’s stability and its mutability. When the procedure tends too far toward habit’s stability, its potential will likely be more disabling than when it is opened toward the potential difference within the very same habit. Much tweaking is necessary to find the right balance between the static and the chaotic. 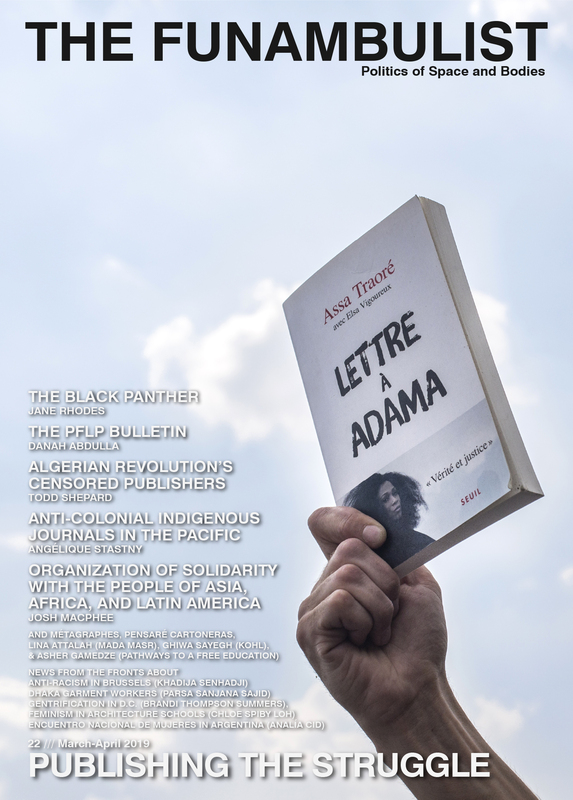 The emphasis on the event’s doubling – its capacity to be present in its futurity – is what allows it to both make a difference in the here and now and keep the future-anterior tense of its potential open to differentiation. It is in the schism of event-time that the procedure does its best work. When the conditions are right and the doubling of existence at its edging into experience is doing its work, a procedural fashioning becomes capable of activating the relational field of experience such that the milieu of existence in its potential modalization is also activated. What is brought into existence here is a co-composition. This co-composition cannot be named in advance. It is only in the event of its culmination, its having-come-to-be (Oh! That’s what it was!) that it will be known as such. This is the tentativeness and fragility at the heart of all procedural fashionings, including those that stray so far from the garment that they becomes wholly architectural in their force of form. Scales and speeds coexist within this tentative fragility, reminding us that the procedural must work at differing degrees of intensity. Every aspect of the procedure matters. “Everything is tentative, but some things or events have a tentativeness with a faster-running clock than others. So that there can at least be a keeping pace with bioscleave’s tentativeness, it becomes necessary to divine how best to join events into an event-fabric, which surely involves learning to vary this speed at which one fabricates tentative constructings toward holding in place” (2002: 48). To become procedural, scales and speeds must also be taken up from the perspective of the event. It is the event that has concern for its unfolding, not a subject or object somehow outside it. Procedures must therefore be crafted that are capable not only of creating the conditions for an event that is available to a human perspective (within the scales and speeds of our own emergent bodyings), but that are also capable of fielding difference in its unpredictable complexity in the arena of the more-than human. In Arakawa and Gins’ writings, as in Kawakubo’s, there is sometimes the sense that the human body rears up as though it were a starting point rather than one of many potential fields of activation within the relational milieu. And yet, a closer look at the workings of their work (including their writing, in the case of Arakawa and Gins) makes it amply apparent that it is the event of the work’s workings that matters. 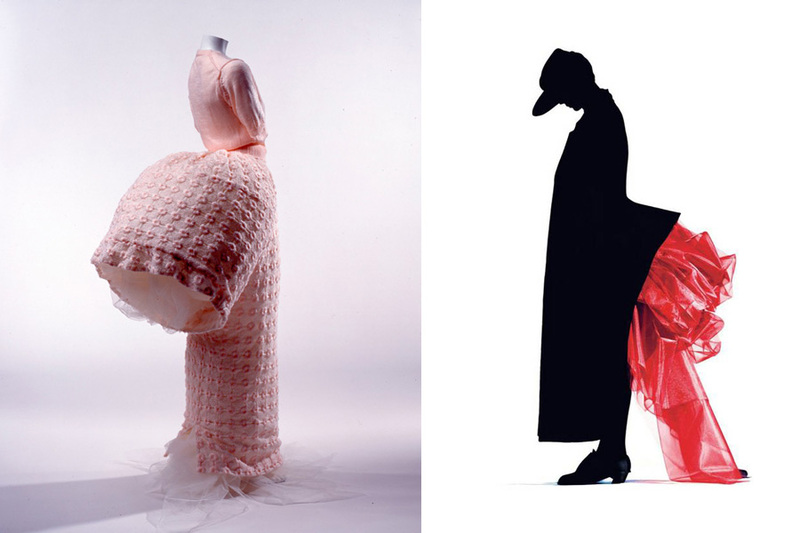 In terms of what they can do, both Arakawa and Gins’ architectings and Kawakubo’s fashionings challenge the view that the human subject is at the centre of experience and that the body can be abstracted out from the complexity of the milieu in its co-composition. Arakawa and Gins write: “We do not mean to suggest that architecture exists only for the one who beholds or inhabits it, but rather that the body-in-action and the architectural surround should not be defined apart from each other, or apart from bioscleave. Architectural works can direct the body’s tentative constructing toward a holding in place, its forming in place. But it is also the case that how the body moves determines what turns out to hold together as architecture for it” (2002: 50). The tentativeness of the procedural is directed not toward a preexistent intentionality that drives the potential of the emergent ecology. The tentativeness is instead driven by tentativeness, the operations procedural at their core. Questions of how outdo questions of what at every turn, the process itself determining the force of what comes to be, a coming-to-be that, at its procedural best, remains doubled in the act of its existence in the time of the event. How the procedural activates a cleaving and what that cleaving can do in its activation of existence’s doubling onto itself is what matters, and the bios in the bioscleave is never the human pre-formed, but the very question of how life-living intersects with what has emerged in the doing. 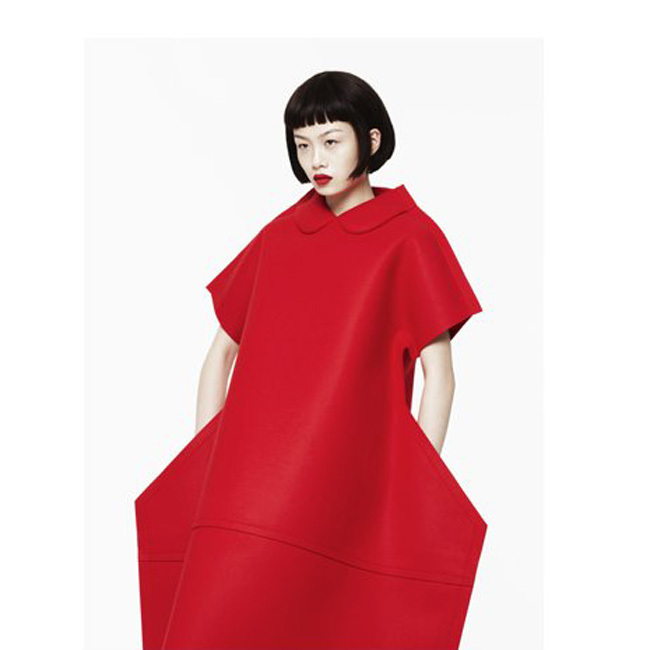 Kawakubo does not design for a pre-existing form. She designs in the event-fabric of a reorienting of what fashioning can be. She begins with the creation of an enabling constraint, exploring how the constraint can create a procedure whose path her creative practice can follow. “I put parts of patterns where they don’t usually go. I break the idea of ‘clothes.’ I think about using for everything what one would normally use for one thing. Give myself limitations.” Key to this process is the fact that even the fabric, the materiality of the proposition that moves her work, becomes procedural, oriented toward a tentative encounter with emergent modes of existence that activate a bodying not yet defined. In Kawakubo’s practice, procedurality moves materiality to its limit. That Kawakubo’s experiments are not constrained to a focus on the garment is necessary: otherwise she would not be capable of pushing the material beyond its attachment to the forms of our most vivid associations. “The main pillar of my activity is making clothes, but this can never be the perfect and only vehicle of expression. I am always thinking of the total idea, and the context of everything. Fashion alone is so far from being the whole story.” The total idea includes the totality of what a material can do, the material here never abstracted from the question of bodying: when Kawakubo asks what the textile is capable of, she is necessarily also asking how a bodying exceeds its putative limits. Creativity is at work, but a creativity not restricted to the creation of an object. When Kawakubo says “one cannot fight the battle without freedom. I think the best way to fight that battle, which equals the unyielding spirit, is in the realm of creation. That’s exactly why freedom and the spirit of defiance is the source (fountainhead) of my energy,” I think what is at stake is not a capitalist creation of the newest new, but the activation of the force of relation that has as its goal the fashioning of a new mode of existence. This new mode of existence is not to be confused with freedom itself. Freedom as Kawakubo defines it (always in conjunction with defiance) is about the not-yet-thought. Freedom is not the goal but the activator of the field of experimentation toward its most productive constraint. Linked to the concept of creativity, which in Whitehead is defined as the “actualization of potentiality,” freedom in Kawakubo’s work is what makes the everyday operational. Speaking of modes of existence, Souriau writes: “It’s a matter of invention (like you “invent” a treasure)” (2009: 142). There is no pre-determined existence (just like the treasure only takes form as treasure when it is considered one). The existence is only ever invented from within the field of relation that is the event of experience. Since no two events activate the same field of relation, modes of existence are by necessity interstitial. The mode of existence comes about in relation to how the event makes a demand on experience. The event that makes a demand on experience is the one that needs to be invented. It is the one that is capable of at once being singular and persistent, now and then. Modes of existence are born of such events that are capable of bridging the schism of their double articulation, of retaining the intensity active in the future-presentness of experience in the making. Kawakubo resists being cornered into ethnicity. Where she comes from is an accident of birth, her husband Adrian Joffe reminds a journalist. This is not to say that the country of her birth has no effect. What it means is that the siting of experience at the heart of the creation of modes of existence is emergent, not simply inherited. Historical memory crosses over, but what is at stake in Kawakubo is never a replaying of it in a simple score. She works with it to create world-constituting procedures that are no more Japanese than they are of any other ethnicity. For modes of existence cannot be categorized according to pre-existing categories, be they shapes, nations, ethnicities, genders: it’s what they do that matters. This is not to underestimate the importance of what came before. As Whitehead would say, nonsensuous perception, the way pastness folds into presentness to tweak the in-act, makes a difference in the coming-to-be of what experience can do. The key is to understand that this nonsensuous perception is not an object fully-formed. It composes with the force of what the present-passing brings to its inheritance. The past is in this way always a futurity in the making. In Kawakubo’s case, one of the areas of inheritance, I believe, is architectural, beginning with the relationship between the kimono and the tatami, patternings that have orientings in common: both carry within their simplicity a complexity of form-takings, both are minimal in their cut, preferring the simplicity of the straight edge, both are open to various interpretations of what a fashioning (of the environment, of the body) can be. In the kimono, a garment used across genders that is cut in a way that does not conform to an idea of pre-existing body-contours (cut beyond the length of the body, for instance in a style that does not recognize sizing as a point of departure, preferring to foreground texture, colour, the artistry of the textile itself) there is the inheritance of a different way of thinking the pattern. There is a sense of the infinite in the cut of the kimono, of the infinite line. The kimono is not made to fit, its lines are not contouring, its cut is not first and foremost gendering (though its textures can be). How it is worn is what makes the difference, and there of course contouring and gendering both occur. But that this happens in this second stage means that there is a potential inheritance in the activity of dressing that retains of a certain sense of how a pattern can be open to its unfolding rather than constrained to form. This openness to the line – think the kimono as an assemblage of straight lines – is perhaps what gives Kawakubo the confidence to ask her pattern-makers to work with patterning as an open field of potential. For instance, it is not unusual for her to give her pattern-makers a material intervention as a procedure for creating a garment. In this regard, she engages in an invested relationship of collaboration at the level of what the materials can do before even thinking of the form they can create. She mentions, for instance, giving her pattern-makers a crumpled piece of paper with an invitation to create something else, something that is not yet clothing, not yet architecture, but a mode of existence that brings both into appearance (Rissanen 2007: 3). Both these inheritances encourage us to connect Kawakubo to a certain version of Japaneseness without limiting her to it. Even more so, they encourage us to see that the inheritance is connected to the procedurality at the heart of her practice. These inheritances, if they make a difference, do so only in the way they connect in or energize a procedure, opening experience in its unfolding to the discovery of the oeuvre à faire, not the work as it has been historically pre-oriented, but the work’s working in the now of its evolution. 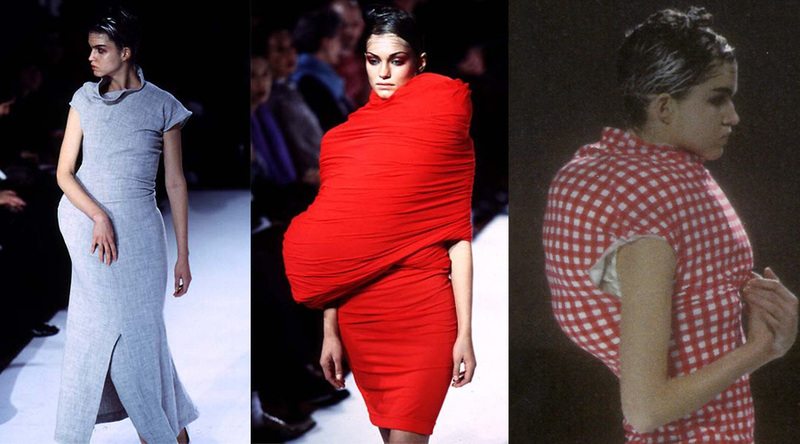 Take the “Dress Becomes Body” Comme des Garçons Spring-Summer 1997 collection. The public’s response when this collection came out was to see the clothing only with respect to what it did to the preexisting body and how it aligned with or diverged from the history of fashion design. Within this contingent of responses came the unsettled gaze that wondered whether this was a collection that made idealized deformity or disability, whether it was an affront to the body itself. All of these approaches to the collection are in the mode of first contact. They all depend on a vocabulary of the pre-existent and on the categories available within this vocabulary. But what if we look further, taking Kawakubo’s procedural fashioning at its word. What if instead of beginning from what we know, we began in an encounter with tentativeness? “Persons need to be rescued from self-certainty, but they also need to put their tentativeness in precise order in relation to works of architecture” (Arakawa and Gins 2002: 50). In the “Dress Becomes Body” collection, a shaping occurs. Why must we assume that this shaping hides a body? Why not take instead this shaping for what it is, as the event in itself? What if instead of assuming that the person is not the shape, we were open to a different concept of personing that included its architecting? Arakawa and Gins speak of “organism that persons.” Could this be what is at stake in “Dress Becomes Body”? Look again, this time refusing to abstract body from shape. See the personing as the architecting and refrain from selecting out from the emergent shaping the contours of the body’s skin-enveloppe. See the shape for what it is: a new contouring. Acknowledge this tendency to see textile as that which covers and not as a materiality in its own right. See textile in the moving, as an active shaping of what a body can do. See textile as an ecology of practices that is not separate from the body which it clothes. And now wonder at the ways you have become capable of abstracting the one from the other (and then wonder about how you abstract the sitting body from the desk, the walking body from the street, the sleeping body from the bed). Look again. This time see the shaping not as a still body, but as mobile architecture. Can you see it beyond an image of what you consider a deformation of a preexisting shape? Can you see that the humpback, the strange shoulder-hip tumour may not prefigure the grotesque body of your horrified imagination but might instead remind you of what you see every day as you walk around the wintry city of Montreal? Look again. Now see the tentative architectures. See the movement that was made invisible by the tendency to abstract textile from body. See the backpack, see the cross-body purse. See the puffy coat with the baby underneath, collar slightly open for its head. See what you see every day from November to March in your cold climate and wonder again why when you saw it in the subway, on the street, in the café, you didn’t see it as a disfigurement. Wonder at how quickly just yesterday you were always able to see this body-dressed-for-winter as a body separate from its dress, at how quickly you unburdened the skin-envelope from its Michelin-Man coat. And note in surprise what Kawakubo’s work has given you: a new mode of perception. Now go back outside and see not the clothing that mask a moving body, but a shape in the making that includes movement, the includes textile, that includes body, the three together an ecology that is an emergent shaping. Note with some awe that the “Dress Becomes Body” collection is not the high and useless fashion you may have assumed it was, but a lively encounter with the everyday. The envelope has been ruptured. We are accustomed to the act of excision. We see the winter-clad body with its thick coat, the knap-sack, the heavy bag and we simply excise them from existence. We assume that the body is the shape underneath instead of the force taking form of an ecology, instead of a speciation? What else does it make sure we don’t see? We don’t feel? If all of this has made a difference, what Kawakubo has achieved with her “Dress Becomes Body” collection is a world-constituting procedure from whose perspective an abstraction of the body as pre-constituted matter-form is no longer the norm. Of course, the mode of existence this creates cannot be seen as given, once and for all. It must create the conditions to be felt anew in each circumstance of its reactivation, mapping the being and the becoming of experience onto one another in their paradoxical double articulation. Souriau has a word for the activation and selection of a mode of existence in its emergence: instauration. This untranslatable word, which means to constitute, to create, to found, to inaugurate, is defined in Souriau as the capacity of the mode of existence to settle itself into the world as procedure. “A philosophy of instauration will bring together at once the modes of the in-act and those of being, studying by which path they can be combined” (2009: 164). The event’s instauration consolidates being and becoming. It creates an opening toward what Whitehead calls the becoming of continuity. Being is temporary, positional, while becoming is directional but tentative. Instauration marks the force of the inflexion that propels this becoming of continuity. It is here, in the activation of difference, that new modes of existence are invented. The “Dress Becomes Body” collection invents a mode of existence that is alliance with what Arakawa and Gins call “a site of sited awareness” (2002: 51). It makes felt the double articulation of the in-act and the acting at the very level of perception itself. To articulate the concept of sited awareness, Arakawa and Gins develop the concept of the landing site. The landing site seeks to articulate how an event extracts itself from the wider field of experience. For Arakawa and Gins, this is a question of “apportioning out”: “That which is being apportioned out is in the process of landing. To be apportioned out involves being cognizant of sites. To be cognizant of a site amounts to having greeted it in some manner or to having in some way landed on it” (2002: 5). It is important to understand that the landing is not first and foremost spatial nor is it oriented by a preexisting subject. The siting is a bringing into relation. This bringing into relation has the capacity to dimensionalize, and when this happens, architectural tendencies in the environment are brought to the fore. But the landing site can also have other functions, working more at the level of perception, for instance, or even making felt edgings of experience that are still in germ. Arakawa and Gins write of “dancing attendance on the perceptual landing site,” of “landing sites dissolv[ing] into each other, or abut[ting], or overlap[ing], or nest[ing] within one another,” of “distributing sentience” (2002: 7-9). The landing site is not a location, not a point, but the tending, the abutting, the segmenting that selects out what is most persuasiveness in this eventful conjuncture. In the siting of awareness activated by this and other Comme des Garçons collections, as with Arakawa and Gins’ built procedural architectures such as Bioscleave House in Long Island and the Reversible Destiny Lofts in Tokyo, what is at stake is this shaping that lands awareness differently. To land awareness is a way of working the work, of faire oeuvre: it brings into focus not the work as such but the very procedurality of the work’s workings. This is not to say that all work by Kawakubo and Arakawa and Gins does this to the same degree. Different procedures produce different ecologies, and the same is true in reverse. While for me, for instance, Arakawa and Gins’ Tokyo lofts are capable of activating a procedural architecture that remains vital and reorienting at each juncture, I find myself less certain about Bioscleave House. Similar materials were used in each of these two architectures, and yet what they do is divergent. This is likely because the fields of relation (cultural, social, environmental) are profoundly different. Whereas in Tokyo the architectural inheritance of the tatami room brings a certain continuity to the work of Arakawa and Gins, providing the participant with a strong sense of the potential of an architecture that resists normative inhabitation, in New York the house feels strangely deactivating, its hard, bumpy floor sometimes more of an affront to movement than an activator. This is not to say that the house has no potential, but simply to emphasize that each ecology of practices will emerge to different effect, opening up different fields of potential that will themselves always to some degree have to connect with the inheritances that come with the act of living. What is most interesting about a procedural approach, therefore, is not the final form it might take. It is how that form remains procedural. In the case above, both architectures remain procedural, but they do so to different degrees. What matters is how these degrees are taken up in experience. What matters is what new processes they enable. What new modes of existence they solicit. What matters is how the work is attended to in the modality of sited awareness, how its instauration is felt and how it persists, how the event becomes procedurally capable of carrying its paradoxical doubleness toward the unknowability “Oh! That’s what it was!,” all the while attending to the singularity of the event in this iteration of its coming-to-be. For work that works does take a stand. It stands in the time in which it lands, and it makes demands on that time. It marks it. A procedural architecting, a procedural fashioning, always involves an encounter with a work that works persists even as it stands, that engages with the openings of potential even as it takes its place, here and now. This is the strangeness of the procedural as world-constituting, that it must at once be taken up in the absoluteness of its self-determination in the here and now and that it must at the same time remain open to the differential of times not yet invented. How to create conditions whereby the here and now and the necessity of time’s unfolding can coexist? This might produce some anxiety. “What can I do so as not to be paced out of existence?” ask Arakawa and Gins. The only way not to be paced out of existence is to remain steadfastly in the act. For to be paced out of existence suggests being on its edge and watching it go by. This only happens when there is an assumption that what happens is outside of the event. If we consider our being to always be in the midst, if we consider that the body is never one, never outside, never enveloped, but always a singular speciation of an unfolding ecology, existence will always to a certain degree include us. But it will not necessarily include in ways we are used to thinking inclusion. It will include us as the more-than, as a society of molecules, as tendings that include the human but are as inorganic as they are organic. It will include us not as the formative initiator of existence, but as the complicit participant. In the midst. Modes of existence as they are crafted out of ecologies of practices will therefore not be primarily human. They will be ecological, active at the interstices of what life is becoming, life understood not in terms only of the vital, but understood as an active vector that passes through the organic and the inorganic. Life here is life-living, life invented in the cut that cleaves different modes of existence, some of them more intelligible to human life, many of them only intelligible in relation. I have suggested that “Dress Becomes Body” architects mobility. This is in line with my earlier work on choreographic architectures. Architecting mobility does not mean creating a site for mobility. It refers instead to a way of understanding the siting of awareness through a focus on the force of form. A choreographic architecture, like its sister concept, “the dance of attention,” is about how an event creates the siting of its potential, and how it attends to this siting. When a choreographic architecture comes to the fore, what is perceived, what is lived is not the siting of the body but the fielding of its mobility. It is here, in the differential folding of the choreographic potential of mobile architectings that fashion and architecture most readily meet. For when fashion becomes procedural what it does is assist us in reinventing how the bodying is already an architecting of mobility at an infinity of scales. Kawakubo’s work embodies such choreographic tendencies, bringing to awareness the dance of attention active in the materiality of her textile creations. This is very apparent in her early work, often termed “deconstructive.” I draw attention to the work of the so-called deconstructive period for two reasons. First to challenge the usage of the way the term deconstruction is used in fashion, and to suggest that deconstruction, taken as an engaged rethinking of what textile can do, is still very much at work in the collections produced by Comme des Garçons. When deconstruction is theorized in relation to Kawakubo’s work (as well as to other Japanese designers such as Yamamoto, for instance), it tends to denote the making apparent of the seams of a garment in a way that creates a conversation about the garment’s form. It foregrounds, for instance, the unfinished seams and tends to make a statement about counter-culture (emphasizing, for instance, the way a given designer refuses to conform to haute couture’s norms). Derrida’s definition of the term takes it much further. For Derrida, deconstruction is never a method, but rather a way to return again to the act of reading or making in order to see how it stages its alliances to form, to history, to epistemology. This approach encourages an account of how the work moves, and what it can do in its incipient activity. In the case of fashion, this allows to turn not to the form itself but to the materiality of construction itself, to the ways in which the deconstructive gesture activates the force of form. In the context of the choreographic in its relation to dance, one of the most interesting aspects is how movement remains, how it is left over from the force of form. Choreographer William Forsythe encourages his dancers to “leave behind” the form of the movement in order to explore what exceeds its form, its representational stature. I have written about this in terms of the “what else,” asking what else can movement do in its fielding of relation? It seems to me that the “what else” is of central importance in Kawakubo’s so-called deconstructive work, a gesture that once again brings architecture and fashion together, but not in terms of scale or form, but in terms of what they leave behind in their relation to inheritance, to environmentality, to the ecologies of which they are part. The garments portrayed in the image below from the spring-summer 2011 collection make this observation felt. What is at stake here is not simply the making apparent of the seams of the garment’s production but a foregrounding of the immanent potentiality in the seams, at the edges, in the linings of the garment. It is important to emphasize that these garments (like many others), placed on display for the runways of that 2011 season, are not for direct consumption. They take the season’s garments (the works that will be sold in boutiques around the world) and emphasize their procedurality, making felt not only the tentativeness of their propositions, but the more-than, the what else, of their constructedness. Kawakubo states repeatedly that fashion is neither the starting nor the endpoint of her research. Fashion for her is not limited to the idea of a holding-in-place of a body as pre-formed. Nor is it about deconstructing the past in the linear sense often attributed to both her work and that of other Japanese designers such as Yohji Yamamoto, nor simply, as the deconstructive vocabulary within fashion would have it, of revealing tradition and pulling it apart at the seams. It is, rather, about constructing toward a tentative holding in place, more re-constructing than de-constructing, thereby cleaving the body-concept toward an architecting that sculpts mobility more than form. That this work reveals its seams is of course necessary at times, and amongst my favourite pieces of Comme des Garçons are these early works, but not simply because they shed and fade and show their fragility, but because they open the act of dressing to the fragile articulations of its very composition, allowing the garment to function as a lively interstice that is event-time. The garments feel alive. For a procedural fashioning there can be no end to the process. This is a serial adventure with pinnacles of form along the way. The middle, the milieu of the act of activating the relation, is what is at stake. The body in-forming, an architecting of mobility that becomes a shape, is part of this middling, active as it is in its capacity for metamorphosis, but it is neither beginning nor end. Kawakubo designs in this interstitial seriality, always toward that which “can and cannot be found,” for “boundaries for an architectural body can only be suggested, never determined” (Arakawa and Gins 2002: 68). In the form-taking of the middling, everything is at stake: what comes to form will make a difference. A collection must emerge, for it is from here, from the materiality of a form-taking, that the next procedure, the next a dress, coat, pair of pants will invent itself. But are these really still dresses, pants, coats? Ideally we would need a processual concept for these incipient forms. A dressing? A coating? A trousering? The same would need to be said of the procedural architectures – not a house but a housing, a lofting, a rooming, a thresholding. For procedural processes to make a difference, they must be created such that they can perform, reshape, constrain in ways unforeseeable. This is a difficult call, and often it fails and the dressing is limited to dress, the thresholding is limited to entryway. In such cases the modes of existence the procedural fashioning sought to create lost the sense of their potential trajectory, becoming less a pathway than a finite project, as Souriau might say, losing the force of their incipient directionality. The complicity here between a procedural fashioning and a procedural architecting is as speculative as it is pragmatic. In either case it cannot be about the product. It has to be about how the procedure does its work, and keeps working. This is hit and miss. It requires a long and rigorous process of experimentation, and a willingness to begin anew without believing to know the starting point. Recall Kawakubo’s constraint: begin with the belief that I don’t know what clothing can be. In a procedural approach nothing can be taken for granted. It is always a question of the emerging ecology, of the architecting toward mobility of an emergent bodying. “Landing site configurations articulate at least this many positions; nearnearground, nearmiddleground, nearfarground, middlenearground, middlemiddleground, middlefarground, farnearground, farmiddleground, farfarground; nearmiddlefarground, nearfarmiddleground, middlenearmiddleground, middlenearfarground, farnearmiddleground” (Arakawa and Gins 2002: 71). But take care, Arakawa and Gins remind us, not to think of these shifting grounds as positions, for they are also “areas of an architectural body, which takes its ubiquitous cue and command from the form and features of an architectural surround, subtending all positions within the surround’s confines” (2002: 71). The environmental surround in a fashioning procedure is infinitely productive, for the starting point is topological: the body is that which folds. Without articulating it as such, I believe Kawakubo’s procedural fashioning takes this notion of the body as its starting point. The fold is where it always begins – the fold of the tissue paper she gives her pattern cutter as an inspiration, the fold of the texture that constrains the scissors when she cuts, the fold that resists, that reshapes, that escapes finite form. Hers is a lifetime of research into the fold, the fold produced by the body’s bending, its kneeling, its touching, the fold of the texturing of a given piece of fabric, of the pleating so often part of her designs, the fold of the inside-out that brings the back to the fore in a garment, turning the seam on itself, particularly obvious in Junya Watanabe’s designs of revolving coats and dresses where the front becomes the back, the fold that resists becoming a seam, or even the fold that gives her the inspiration to create her recent Autumn-Winter 2012 two-dimensional collection, a collection that strangely accentuates the body’s n-dimensionality. A procedural architecture is one that takes the fold as the point of inflexion, that makes apparent how the fold is the force of form the Euclidean architecture of our most normative surrounds must always build against: the fold of the hill within the landscape, of the air as it rushes against cement, creating a vortex that bends and twists, the fold of the body that moves with the building’s capacity to make space for it. To commit to a procedural approach is to commit to this fold, and of course to commit to how it cleaves, and then to persuasively include it, to architect at its limit, inventing new ways of colluding with it, all the while attending to the dance of attention active within the force of the event’s own procedural unfolding. For what the fold does first and foremost is remind us that the body is never one, is never outside the ecology of its environmental architecting, its nearfarmiddleground never a question of bare ontology. The body is that which folds into the architectural surround, that which folds into the architecting of mobility that sites awareness, that which folds into its own activity, that which remains infinitely serial, that which cannot but procedurally unfold. What a procedural fashioning can do is bring this tendency to its limit. Kawakubo’s procedural fashioning design here, at this point of inflexion, architecting toward the creation of fragile modes of existence which, in their turn, can create conditions for new and different procedural fashionings. Here, in the edging into itself of world-constituting procedures, Kawakubo designs not for the body but for a belief in the world. 2. This concept is developed at more length in “Just Like That: William Forsythe, Between Movement and Language” in Erin Manning and Brian Massumi Thought in the Act (Minneapolis: Minnesota UP, 2014). 4. It is important to emphasize that not all collections are primarily designed by Rei Kawakubo, though she does supervise the process. Junya Watanabe has been an important designer for Comme des Garçons, first as a patternmaker starting in 1984, and then as a designer in 1987. He started designing under his own name in 1992. Other designers include Tao Kurihara and Kei Ninomiya. 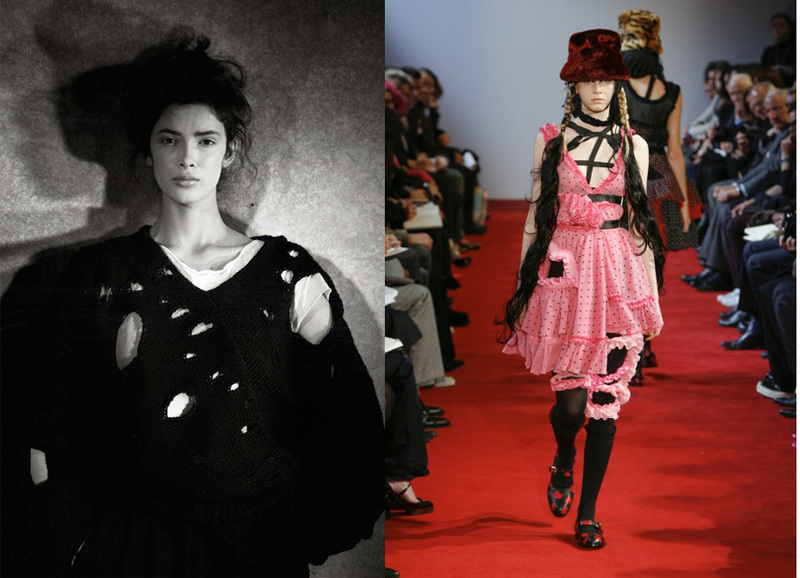 5. http://www.businessoffashion.com/2013/10/rei-kawakubo-comme-des-garcons.html visited February 24 2014. 8. For more on Whitehead’s concept of creativity, see Adventures of Ideas. (Free Press, 1938 pp. 179-180). 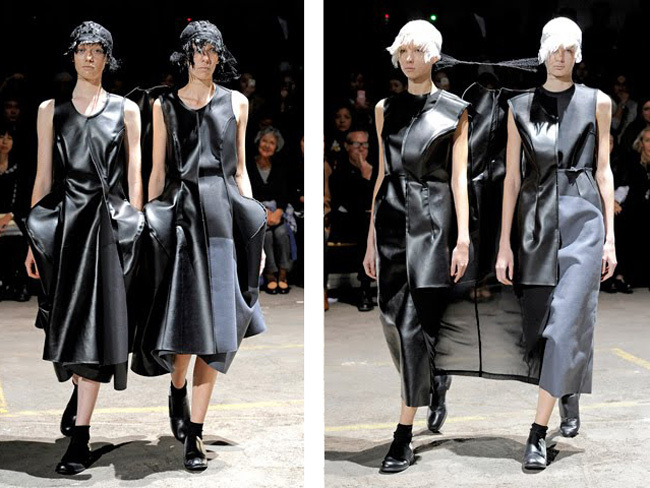 12. http://www.businessoffashion.com/2013/10/rei-kawakubo-comme-des-garcons.html visited February 24 2014. 13. http://www.businessoffashion.com/2013/10/rei-kawakubo-comme-des-garcons.html visited February 24 2014. 14. There also exist indigenous traditions in garment design that challenge the idea of the predefined shape of a body, inviting the body to define itself through an encounter with the fabric. These include the Indian sari, the Malay or Indonesian sarong, and the African kanga or kitenge, each of which is emergent as garment in the folding. Gins, Madeline and Arakawa, Arriving soon–Biotopological Diagramming, A New Procedure/Method for Staying Alive Indefinitely from Alive Forever, Not If, But When. Unpublished Manuscript. Joffe, Adrian. “The Idea of Comme des Garçons” http://hypebeast.com/2011/1/adrian-joffe-the-idea-of-comme-des-garcons Jan 10 2011. Kawakubo, Rei. “Rei Kawakubo’s Creative Manifesto.” http://www.businessoffashion.com/2013/10/rei-kawakubo-comme-des-garcons.html 30 October 2013. “Rei Kawakubo in Her Own Words.” http://www.anothermag.com/current/view/3075/AnOther_Magazine_18__Rei_Kawakubo_in_Her_Own_Words 3 October 2013. Kawakubo, Rei and Socha, Miles. “Rei Kawakubo: Exclusive Q&A.” http://www.wwd.com/fashion-news/fashion-features/rei-kawakubo-qa-6486260 November 19, 2012. Manning, Erin. Always More Than One: Individuation’s Dance. Durham: Duke UP, 2013. Manning, Erin and Massumi, Brian. Thought in the Act: Passages in the Ecology of Experience. Minneapolis: Minnesota UP, 2014. Souriau, Etienne. Les Différents modes d’existence suivi de L’oeuvre à faire. Ed. Isabelle Stengers and Bruno Latour. Paris: Presses Universitaires de France, 2009. Whitehead, Alfred North. Adventures of Ideas. New York: Free Press, 1938.